Day 1 of my week of jazz, and I kick it off with a big bang with a revisit to one of the most influential and profound jazz groups that shaped the path of contemporary Jazz. 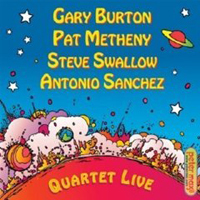 Gary Burton is reunited with Pat Metheny, along with Burton’s long-time musical companion, Steve Swallow, and newer addition, Antonio Sanchez, who is a regular in Pat Metheny’s current quartet. 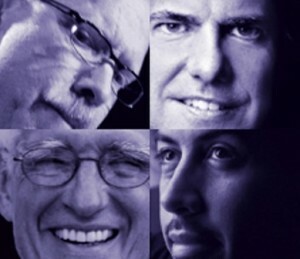 The concert and the album are entitled “Revisited” alluding to the period and songs in the early 70′s that first introduced us to a young Pat Metheny when he then joined the Gary Burton Quartet. The concert in Toronto on June 29th was as what all jazz fanatics could hope for: a packed house, an awesome acoustically-inclined music hall, and four of the most talented musicians around. Gary Burton played as masterfully as ever. I had seen him play once before at the Toronto Jazz Fest in 2005 when he performed his “Next Generation” tour alongside the then emerging Julian Lage. I can never get over the intricacies of his four mallets as they move across the vibraphone keys. The double mallets in each hand are mesmerizing to watch, especially if you notice the subtle way Burton changes the distance between the two mallets in each hands to produce different sets of chords & harmonics. I am utterly amazed at his speed, and it is obvious he’s perfected his muscle memory in the 40 years he has played. Pat Metheny continues to be at the top of his game. He played four different guitars that night, including his 42-string Pikassa guitar. As we all are so well familiar with Pat’s legendary style, I won’t say too much, though it is always the greatest pleasure when I get a chance to watch him perform life. More posts coming on this week as I travel from Toronto to Ottawa to Montreal and back to Toronto again following all three international jazz festivals.